Natural Dry Creek Turquoise & Coral Eagle Belt Buckle 1 1/8"
Our Native American belt buckles, bolos, and concho belts are made by incredibly talented Navajo, Hopi, Zuni, and Santo Domingo artists hailing from Arizona and New Mexico. Our selection of belts, belt buckles, and bolos feature genuine .925 sterling silver and authentic gemstones such as turquoise, amethyst, spiny oyster shell, coral, and lapis. Our leather belts also feature high quality leather. Most of our concho belts and belt buckles look great on both men and women, and there are a variety of designs to choose from, so you can find the style for you. Native American silversmiths have been crafting silver belt buckles ever since silversmithing was first introduced to the Navajo in the 1850s. The Navajo Atsidi Saani learned all about the craft at Ft. Defiance in Arizona during that period. Not long after that, silversmithing and the art of belt buckle crafting was shared among the Zuni and the Hopi tribes. and each tribe developed its own unique styles of jewelry-making. Over time, silversmithing techniques became much more sophisticated, and with the addition of soldering, Native American silversmiths were able to join pieces together and set gemstones into their jewelry. Turquoise is the most prominent gemstone found in Native American jewelry, and we have several sterling silver and turquoise belt buckle designs within our selection of Native American belt buckles and bolos. 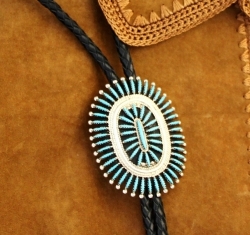 The bolo tie was invented by Victor Cedarstaff in 1948, and was traditionally worn by cowboys and ranchers. The bolo tie is typified by a braided leather cord that usually has decorative metal tips, and is secured by a decorative slide or clasp. The cord forms a loop around the clasp and hangs over the neck like a necktie. In the 1970s the Navajo and Zuni began using the bolo tie design for their own creations, working with sterling silver, cultural artwork, and beautiful gemstones such as turquoise, lapis, malachite, jet, and coral. Our selection of bolo ties features genuine sterling silver, quality leather, and 100% authentic gemstones. 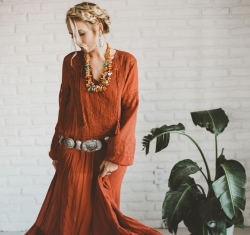 Besides our Native American belt buckles and bolos, we stock absolutely gorgeous Native American concho belts, which are a beloved icon in Southwestern jewelry. Concho belts are generally a Navajo art form, and developed since the late 1800s; they traditionally range in style from round and simple buckle decorations to ornately decorated sterling silver and gemstone-studded buckles. We carry a variety of concho belt designs to suit your taste. We source all of the pieces in our collection of Native American belt buckles and bolos from local Native American tribes. Our gemstones are high grade and are mined in Southwestern mines, a rarity today considering the number of closed mines. We select for gorgeous work from respected artists, and we're confident you'll find a piece that you will love to wear for years to come. If you have any questions for us, please call at 888-476-4367. Take a look at our gallery and order yours today.